Electronic Super Joy was originally released back in August of 2013 on Steam for PC. It has since made its way to Android, Xbox One, Wii U, Microsoft Windows, Linux, iOS, and Mac OS. I will be reviewing the recently released Xbox One version! Electronic Super Joy at its core is a difficult platformer. You control an unnamed character who can use various abilities such as double jumping or a bounce attack to beat the levels of the game. The levels are all designed around using these abilities to progress. There are many obstacles, enemies, and bottomless pits to overcome. All foreground objects are black and contrast the backgrounds very nicely. You will spend most of your time while playing ESJ screaming at your television or possibly throwing your controller thanks to its crazy difficulty like I stated earlier. You can only take one hit before you are sent back to a previous checkpoint. All deaths are caused by player mistakes so you must master the controls and abilities. The graphics are just what you would expect from a wacky platformer, not too much detail but enough so that it is appealing to the eyes. The different levels have varying designs and backgrounds that can change the mood drastically. This keeps the game fresh and new feeling. 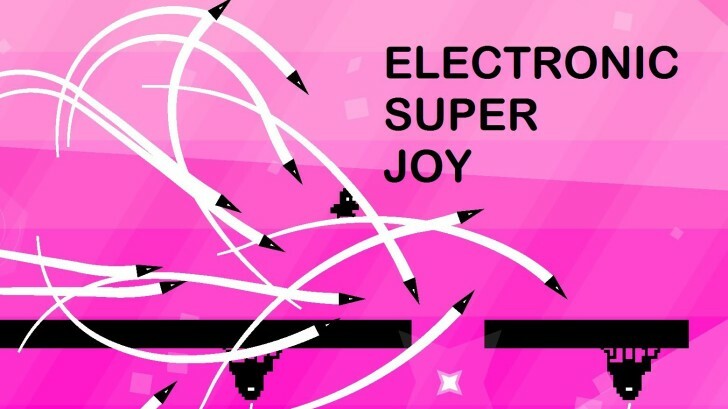 Electronic Super Joy boasts a fantastic and catchy electronic soundtrack that perfectly matches the style of the game. When you pass checkpoints you will get a male or female voice saying, “Oh Yeah” which made me laugh every time. No matter how angry you get at the game you will always be tapping your foot along to the music! There is a ton of fun and frustration to Electronic Super Joy. I don’t play too many platformers but I found myself very engaged with the story, music, sound effects, and level designs. It’s very silly but kept me laughing and yelling all the way through. The difficulty may push some gamers away but if you give it a chance you might end up loving it like I did. Electronic Super Joy is an intense and difficult platformer with a ton of personality. The story is fantastic, soundtrack is catchy, and gameplay is smooth. If you enjoy games such as “Geometry Wars” or “The Impossible Game” you will definitely like this game. It is different enough and packs a lot of content for your enjoyment. If you are a casual gamer you might want to give this game a try anyways. You can pick it up for $10 on the Xbox Live Marketplace right now! Do you enjoy difficult platformers? Will you be trying out Electronic Super Joy? Let us know in the comments section below! I have always been in love with videogames from birth and I am expanding my horizon while becoming more creative.